Why monthly ongoing training? Because handlers love scent detection work as much as the dogs do. We work with dogs and handers to help them achieve all levels, and scents so they can trial and excel in any Canadian or US organization. 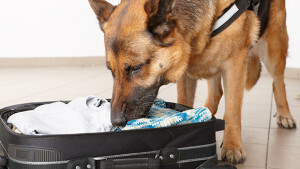 Scent detection is one of the few dog sports that lets your dog take the lead and do what comes naturally. This is also the sport to be in if your dog is reactive or not a candidate for high level obedience training. Only one dog is ‘in the area’ at a time. Level one scent is pure wintergreen. What Do We Have Planned for 2017? We will be hosting a workshop inviting a professional detection handler in the late spring, early summer. This membership does not include workshops, clinics, or trials. You are buying a month’s access. The fee is not prorated for nights missed, or arriving late. This membership does not cover access when the Quonset is not reserved for scent club. REGISTRATION: Registration is Pay as you go. Just buy a K9Klub Card when you come the first night.